← I’d Say That’s Pretty Much a Relationship-Ender. 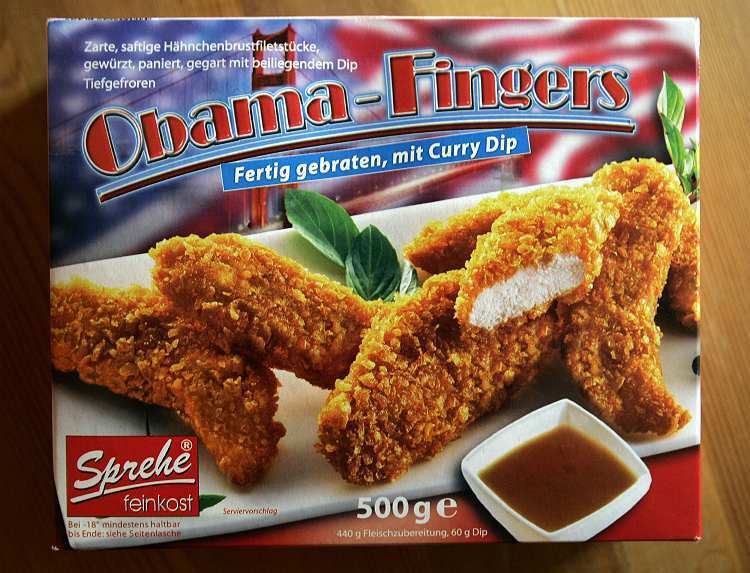 The German frozen food company Sprehe is offering a new product called “Obama Fingers,” which the packaging [above] describes as “tender, juicy pieces of chicken breast, coated and fried,” the German news magazine Der Spiegel reports. a risk that the product might be seen as racially insensitive. Fried chicken has long been associated with African-Americans in the US — naming strips of fried chicken after the first black president could cause some furrowing of brows. Witting told SPIEGEL ONLINE the connection never even occurred to her. “It was supposed to be a homage to the American lifestyle and the new US president,” she said. Twenty bucks says Obama smiles it off. Hmmm. They never named chicken or a food item after Pres. Carter or Pres. Clinton?? Hmm. And they loved Clinton! The unbearable whiteness of chicken, in this case. Struck me not as the “watermelon” variety but the “bet you’ll blink first” variety of chicken. President Obama is still within his first 100 days, I’m hoping however, some time before his term is over that he will stop just ‘smiling’ things off.